Ed.Note: Photo at the top of this page by Justin Fox Burks, property of Memphis Tourism. The Homeroom Chicken and Grids from downtown restaurant Lunchbox Eats is what KFC’s Double Down sandwich wishes it could be, but can’t. It’s a brilliant take on the classic Southern combination of chicken and waffles: battered fried chicken strips covered with cheese nestled between the two halves of a waffle. If that sounds a little extreme, trust me, it is. The only thing remotely good for you involved is the optional green tomato relish. If the batter on the chicken were any thicker, this sandwich would just be another carb-loaded gut bomb. Instead, it’s delicate despite its density. It’s both the best idea and the worst idea I’ve had today. 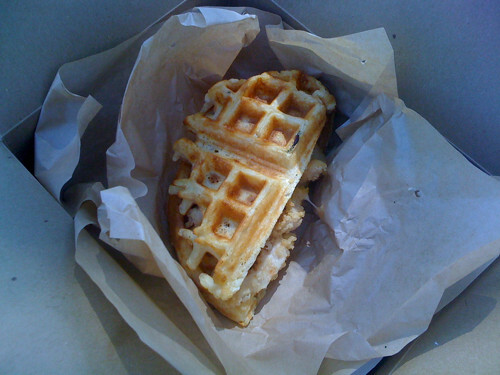 The evil geniuses behind this sandwich work at Lunchbox Eats, which opened in September 2010. Their menu is mostly soul food with a twist, and the decor is school themed (to order, you circle what you want on a worksheet, put your name on the paper and turn it in). They’re only open for lunch Monday – Friday. Get yourself the holiday chicken salad (above) served on a cornbread muffin. Or some of their amazing baked mac ‘n’ cheese (below) or a daily special like fish tacos (below that). Read more about Lunchbox Eats’ daily lemonade and “scooby snacks” here. I went there for lunch today and ordered the “Leadership Club”. The only two words I can use to describe it are “ridiculous” and “delicious”. Here’s the construction of this beast: Texas Toast | Pulled Pork | Grilled Onions | Texas Toast | Mac-n-Cheese | Texas Toast. They also have possibly the nicest staff you will ever meet.